Celebrating 40 years since it first opened in London's West End, Andrew Lloyd Webber's new production of Jesus Christ Superstar. In the confines of a London dinner party, Tim Minchin does verbal battle with a new-age guest named Storm. Another 'odd' interpretation, but the best one since the 1973 movie. This is surely the best attempt at rejuvenating Lloyd Webber and Rice's under appreciated work since the 1973 movie featuring Ted Neely and Carl Anderson. It does however fall into similar traps from previous productions, in so much as, directors incessantly feel the need to modernise or set it in some kind of wacky environment, sometimes at the expense of logic. The most bizarre example being Ponteous Pilate doing push up's after tennis, whilst pondering Christ's fate. This production is for arenas and stadiums only; A gift to the awesome array of session musicians, who smash their way through the big numbers with aplomb, whilst still providing tenderness where needed. The cast also benefit from the size and scope of this production, but for different reasons. As a paying member of a 40,000 strong audience, one can imagine being swept away with Mel C's Magdeline, as would her voice have been swept away with reverb, and bolstered by the awesome accompaniment. But on TV, listening to the direct feed from the desk, her interpretation lacks all subtlety, and is harsh on the ears. No doubt her brief stint in the west end production of Blood Brothers, entertained Lloyd Webber's sensibilities both Musical Theatre, and commercial. 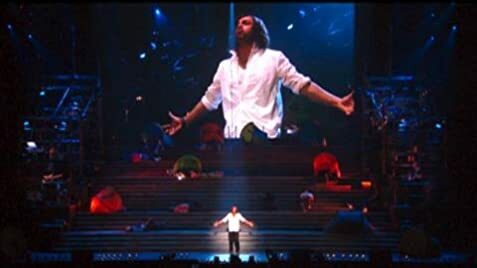 Sadly, Ben Forster as Christ also disappoints due to a lack of rock authenticity. He seems to have the range (although he does seem to split his long held high note at the end of Everything's Alright - did that go unnoticed in post production? Or was it the 'warts and all' approach to editing live events?) but the higher notes are reached not unlike a choir boy. The 'screams' of Ted Neely and Ian Gillan are here replaced with a dulcet falsetto. And there is a lack of anger: Tim Rice's interpretation of Christ in his final days is as impatient and angry, as would any real man's mentality be. Forster however, is a whimpering victim, failing to find the good stuff needed for The Temple scene, and only marginally improving for Gethsemanie. Tim Minchin, however is a ray of light. There is no doubt that he delivers vocally in his big numbers, but that's where his focus seems to be, and not on the smaller moments where his voice is quite thin, and glassy. But due to the benefit of close up telly, his complete and utter emotional investment in the character, and what's at stake are undeniable. Whilst I'm not a massive fan of his tone, It's a great performance, with little attempt at hiding or covering up his own stylings, putting his own stamp on the character - a rock 'n' roll hallmark. Chris Moyles is adequate as Herod. This is to Superstar what Master Of The House is to Les Miserables, and is much loved, a lot of fun, and therefore, hard to get wrong. The 'wacky' re-imagining DOES work here, presenting the song as a live 'phone-in' /Jerry Springer-esque telethon of some kind. Bringing us round to design. It's done really well, with a huge screen covering various on stage moments, as well as providing storyline background ideas, atop a huge staircase. of which some steps retract or move. 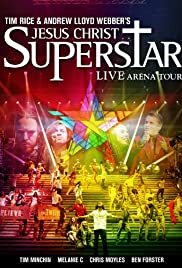 On the whole, it's great to see Superstar given the treatment it finally deserves, and as a fan of the show, musician, and actor, my hat goes off to the rollicking band, and energetic supporting cast. Superstar rocks, again!